Jordan Kimball was a student in my MKTG 384 course (Integrated Marketing Communications) at JMU during the spring 2016 semester. After learning that Jordan was one of 40 students selected nationwide to participate in the Marketing EDGE Collegiate Summit, I wanted to hear all about her experience. Jordan kindly shared her perspectives for an interview-based guest post on my blog. Continue reading to learn more about the summit from a student participant’s perspective. How did you hear about the Marketing EDGE Collegiate Summit – Digital? I was first introduced to Marketing EDGE as a student in Dr. Clarke’s course in spring 2016. Our class participated in the Marketing EDGE Collegiate ECHO Challenge, which I really enjoyed being a part of. During that semester, I was browsing the JMU Recruit-a-Duke website and saw a link for the Marketing EDGE Collegiate Summit. I looked into it and thought “Wow this would be an awesome opportunity”, but did not apply to the summit right then and there. Shortly after, Dr. Clarke sent out an email to her students about the summit, which reiterated to me that it really was something I should consider, and I decided to apply. I decided to apply for various reasons. First, I have always been passionate about marketing and after taking Dr. Clarke’s class, I knew digital marketing was an area I definitely wanted to further pursue. The idea of learning about the industry from experts I wouldn’t usually have the opportunity to interact with sounded like a once in a lifetime experience. Secondly, the location was ideal. I grew up in Central New Jersey, about 45 minutes outside of NYC, so I’ve had my fair share of visits. However, the city is limitless and I definitely have not seen it all. I was excited to discover that the summit would be held in the Financial District, meaning I would spend time in offices on Wall Street and in the World Trade Center (AKA the ultimate corporate dream). New York City is filled with endless opportunities when it comes to employment, especially in this area. I was very intrigued at the thought of experiencing what business life is actually like. Lastly, just like any other JMU business student, I would really like a job. At the time I applied to the summit, I had already accepted an internship position with a company in Midtown Manhattan. Although this was a great opportunity, I was nervous that it was not related to marketing enough, and therefore wouldn’t help me transition into the field I aspire to work in as smoothly as I hoped. I felt that the summit was another chance to gain exposure to the digital aspect of the industry and that attending this conference and learning as much as I could would only help me in the future. If I’ve learned anything from being a business student searching for internship and career positions, it’s the importance of NETWORKING. Attending a conference with undergraduates from all over the country and connecting with some of the most successful professionals in the field was the number one reason I knew I needed to do everything I could to be accepted. What did you do at the summit, who did you meet, and what was your biggest takeaway? Night 1- Sunday, June 5th: I arrived at the Holiday Inn in the Financial District of Manhattan in the afternoon and met my roommate who was an undergraduate from the University of Pittsburgh at Johnstown. Then, all of the attendees went to a kick off dinner at South West NY (courtesy of Marketing EDGE, lucky us!) followed by a double-decker bus tour of the entire city. It was a great opportunity to be able to get to know all of the students and our advisors. Day 2- Monday, June 6th: Opening session took place in an awesome office on Wall Street and we had our first day of presentations given by five marketing professionals: Professor Leora Kornfeld of York University Schulich School of Business presented “How It’s Made: The Connection Between Chocolate and Data”. “What’s So Great About Email Marketing” was presented by Laura Derr (Marketing Operations Manager) and Kimberly Oscarson (Associate Director of List Marketing) both from Hearst Magazine. “Social and Customer Marketing in a Mobile World” was presented by Megan Maguire (VP, Digital Customer Experience and Marketing Consumer Services) at American Express. Yvonne Heyne (CEO of Next X) presented “Personalized Engagement: the Uncompromising Value of 1:1 Mobile Relationships”. Finally, “The Search Marketing Landscape and its People” was delivered by Michael McVeigh who is the VP of Advisory Services Practices at PMX Digital. The presenters were all very interesting, but the most memorable for me was Megan Maguire. She discussed how relevant mobile marketing is today and how it impacts the consumer in such a social world. She told us about how important partnerships are and mentioned some of the many partnership relationships American Express has, including its current one with Coachella. Day 3- Tuesday, June 7th: We continued with presentations this day, but also took part in more hands-on workshops as well. My favorite workshop was led by Tim Carr, the Chief Lifter at LIFT Agency in California, (Chief Lifter is LIFT’s creative title for CEO). Mr. Carr taught us a list of important rules used to create successful campaigns. Then we broke up into small teams and were asked to improve two real campaigns from competing companies based on the rules we learned. The biggest take away I had from Day 3’s presentations was the importance of Programmatic, which is the automation of digital media buying in real time. This presentation was given by Laura Rodriguez, the Senior Manager of Global Planning and Operations at the New Marketing Institute, which is a branch of Media Math. What made this presentation so special was that I learned it is possible to become certified in Programmatic, which is very beneficial for the next generation of marketers who will be looking for jobs in the near future. That evening, we attended a reception with the Marketing EDGE Board of Trustees. This took place in the Media Math office located in the World Trade Center, which overlooked a beautiful portion of the city, including the Statue of Liberty and the Freedom Tour. There were finger foods and drinks served and we were free to mingle with a wide variety of professionals. It was a great experience to network with a diverse group of successful marketers one-on-one. One interaction that stood out to me was with Jeff Nesler who is the Senior Program and Web Manager for Marketing EDGE. He told me that JMU students often do very well with Marketing EDGE competitions and that our College of Business has earned top awards in recent years. It felt great to hear that my university has such a positive reputation. Day 4- Wednesday, June 8th- This was our final day of presentations and activities. I was lucky enough to meet a great recruiter, Ms. Meredith Trotta, who is currently a Principal at Polished Student Recruitment Consulting, and held past positions recruiting for Time Inc., the University of Connecticut, and the Penn State MBA Program. She put us through extensive workshops on how to be successful during interviews and networking events. Another really important portion was resume roulette, where we were able to sit with HR specialists one-on-one to review our resumes and receive helpful feedback. I learned a lot through these feedback sessions, but one piece of advice that stuck out to me especially was to always have a “you in a few” prepared. This is essentially an “elevator pitch” and entails telling someone about yourself in a concise manner that will help you stand out and be remembered. During this session, we also sat in on panel discussions. The first was “Global Privacy in 2016: Strictly Compliance or Marketing Opportunity?” The speakers discussed how the privacy sector has changed over the years and how much more relevant mobile technology is becoming. This was interesting, because we learned about privacy laws and the differences between ours and other countries. For example, European websites need more consent before taking personal information from viewers than the U.S. does, and that information is taken through cookies. The next panel discussion was “College-to-Career Panel: True Tales of Real Survivors”, which was very beneficial, because it consisted of real professionals telling their story of how they got to where they are today in the business world. It was relieving to hear that even though some people struggled finding the career they loved at first, it worked out for them in the end. After interacting with them, I felt motivated to work hard towards my career goals and to not get easily discouraged. Lastly, I was thrilled to be a part of the summit for the first ever EDGE Awards. This was a huge event held at Gustavino’s and was pretty much a giant party and perfect opportunity to network. There was great food, an open bar, a live band, and an endless amount of professionals to talk to. Most importantly, there was an awards ceremony for different businesses and professionals that have done a great deal to support Marketing EDGE’s mission. Although there were so many presentations, activities and events throughout the day, we were also given a good amount of free time to explore the city and have fun with the new friends we met throughout the conference. Do you have any tips for JMU students who want to apply to the Marketing EDGE Summit? My number one piece of advice for students considering applying for the summit is… DO IT! If you think this field is something you are interested in,you should definitely go for it. It is an awesome opportunity for upcoming seniors, but I encourage underclassmen to give it a shot as well. If not successful the first go around, don’t be discouraged! My roommate did not get accepted her junior year and applied again and said she was really happy she didn’t give up. If I have one regret, it is that I did not know about the summit sooner. I feel that being introduced to such a wide variety of companies before senior year could have helped broaden my search for internships. Overall, it was an amazing experience to learn so much about marketing and to go beyond your comfort zone. Being in a new place and meeting new people is always nerve wracking, but I promise it was more than worth it. I made friends from all over the country that I plan to stay in touch with, and gained professional contacts that are willing to help with future endeavors in any way they can. Thank you once again to Jordan Kimball for providing such a detailed accounting of the 2016 summit experience. Based on what she shared, I definitely will encourage more of my JMU students to apply for this exciting professional opportunity. 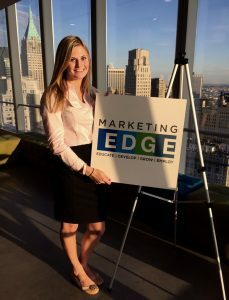 Learn more information about Marketing EDGE, marketing career opportunities, and the Marketing EDGE Collegiate Summit.